There’s been a lot of news regarding how the Internet of Things will change everything. From products like connected thermostats to connected cars and refrigerators, it seems that the Internet of Things has taken off. The Internet of Things (IoT) is a concept where objects is connected to the Internet framework and is able to identify themselves to other devices. There was a question whether we can ever design a high availability Internet of Things that can replace the smart grid. Step 1: The transmission of energy. It’s technically correct to say that the early electrical grid was a smart grid. The protection & controls for the transmission system were based on electromechanical relays, switches, and breakers. If there’s a fault on the line, the relays sense and the breakers trip. Come 21st century and not much has changed. The only new thing is microprocessor relays, which provides a quicker detection and response time for fault protection. Step 2: The management and distribution of energy. Utilities now use SCADA systems, allowing control centers to remotely isolate grid pockets quickly. Solid state meters have replaced the electromechanical ones. In addition, energy management and energy efficiency is a key factor. Since at least 1/3 of energy is lost from the plant to the plug, the most potential for substantial energy efficiency gains is from the user. Step 3: Device Interaction with the Electrical Grid. In this step, power plants maintain constant communication with residents and businesses. Appliances can self-adjust to consume less power or even turn off. With the data collected from all the devices, algorithms can calculate the exact energy demand, reducing the need for standby generation. Over time, generation can be automatically shifted according to a predicted rise and fall in demand. 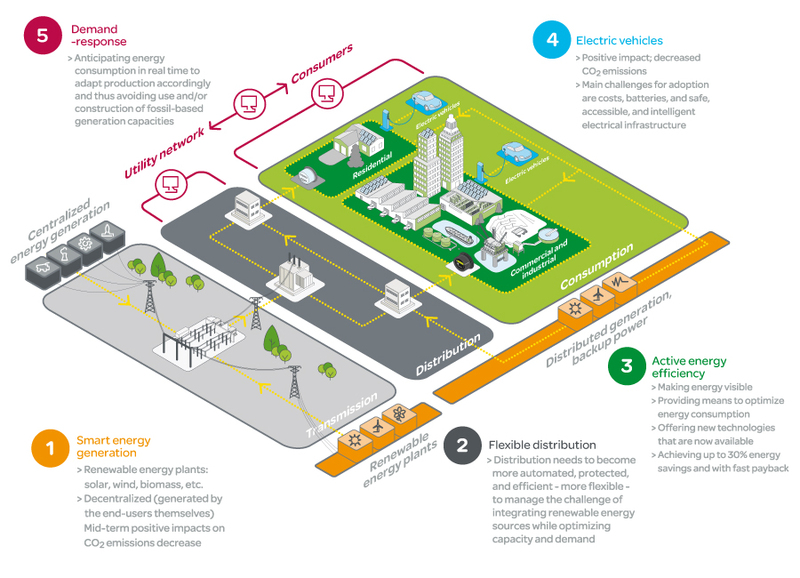 As it turns out, IoT fits nicely into the final step of the smart grid transformation. Some of Schneider Electric’s solutions, EcoStruxure and StruxureWare, have already followed followed this concept. EcoStruxure brings together traditionally separate systems, lightning, HVAC, security, and IT, into one platform, which increases energy management capabilities. Since information is power, the more you know about your system, the more you can manage. Although designing the IoT framework for energy management capabilities requires a significant commitment in resources, a properly implemented smart grid network in which all devices are in communication could provide substantial energy efficiency gains and a move towards a much more sustainable future. Energy companies are ahead of the curve using smart grid technologies for efficiency and response. Internet of Things gives energy consumers tools to actively become a part of a smart grid and extend its capacity to achieve sustainable energy.